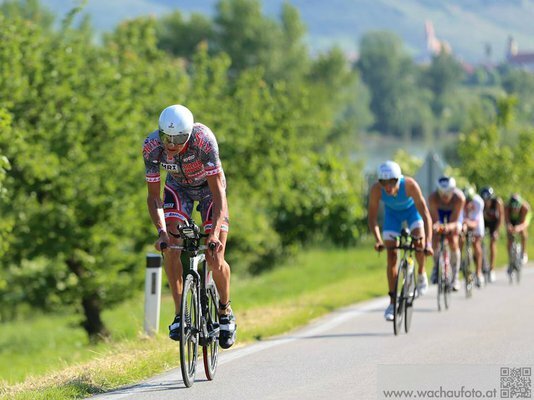 Another race and another great result by SRM sponsored athlete Michael Weiss taking the podium at his home race in St.Polten, Austria. 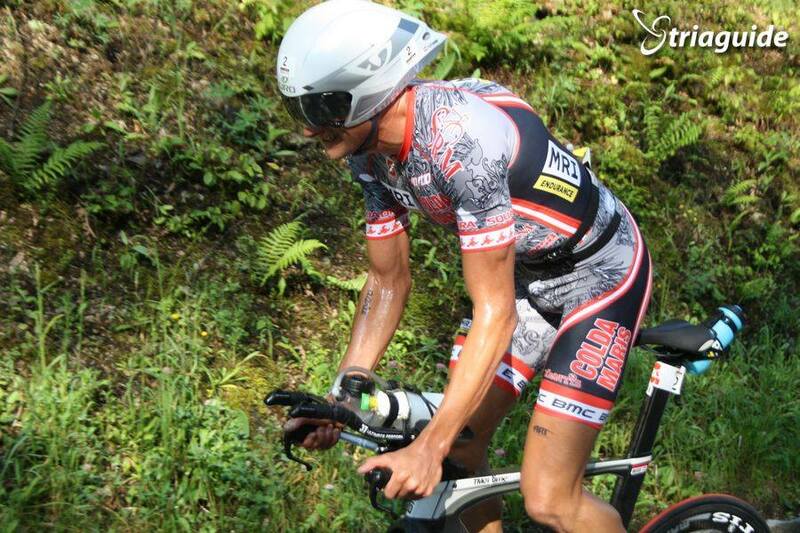 His overall time was 3:53:45 which included the fastest bike/run combination of the day for his 4th consecutive race. 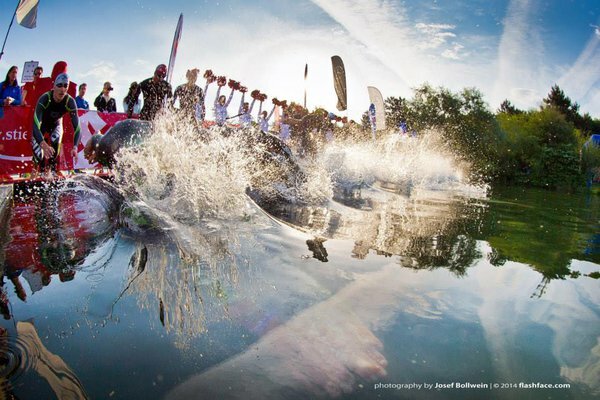 Eneko Llanos and Marino Vanhoenacker took the two top spots respectively. 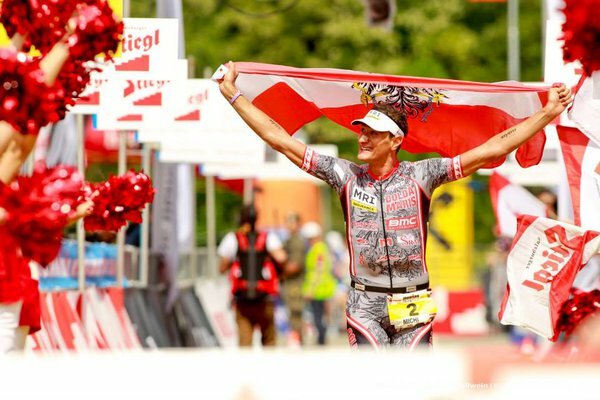 Great weather, which went from a warm and pleasant 18C at dawn to 25C by the time many of the age group ranks were coming home, combined with superb race day organisation and an electric atmosphere which the Austrians seem so good at creating, resulted in a super day for all. Congratulations to everyone involved. 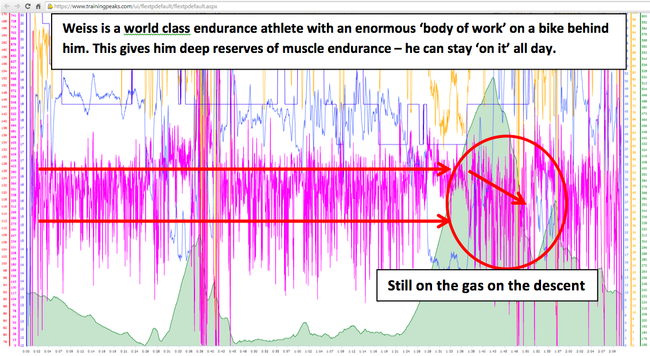 Firstly, if we simply look at race time spent in the sort of power training zones you may use yourself, taken from either Critical Power tests or a Functional Threshold Power calculation, then we can see a marked difference in the level of intensity our two athletes are able to sustain for the duration of a 90km 70.3 bike ride. 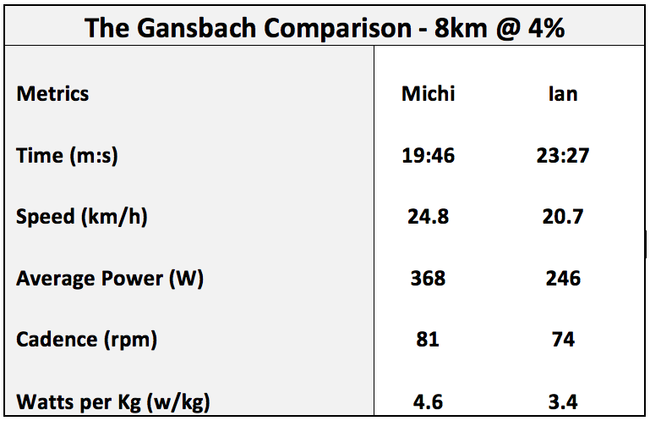 Michi is able to ride at not only a higher absolute power output for the duration than Ian (339W vs.227W), but at an output that is also higher relative to his own capacity. 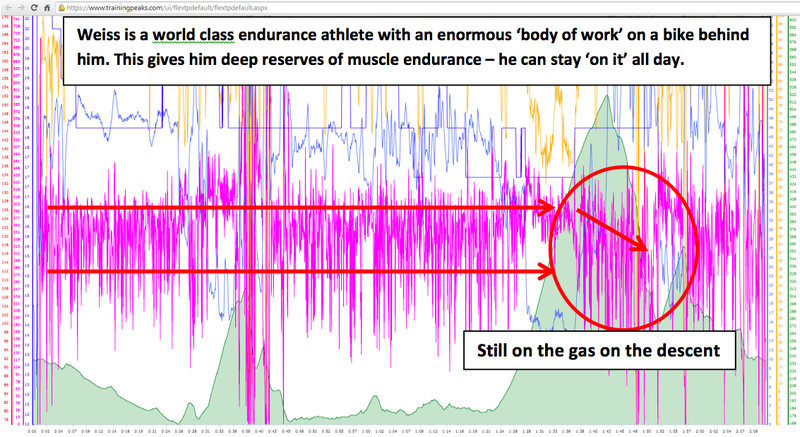 Where Ian can sustain 75% of his Critical Power for the 90km (which is already excellent for an age group athlete), Michi can sustain 83%. In other words, he can go ‘deeper’ and maintain it. This is due to training status, years of training volume, metabolic efficiency, plain old genetics and so on. World class athletes are special for a reason after all! 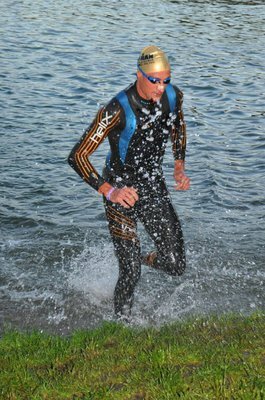 That said, age groupers can and should always strive to improve their ability to sustain a higher race power. This can be improved with the right training and patience. Changing the way the body fuels exercise ie using more fat at higher intensities, takes time. 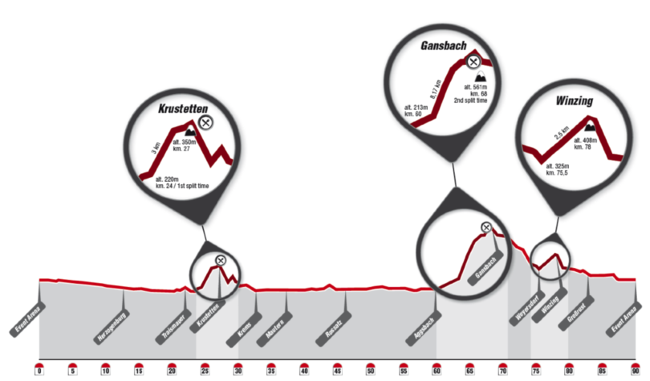 The IM St.Polten 90km bike loop features 3 fairly easy climbs when taken in isolation, but as always in long course triathlon it is the athlete’s ability to meter out the watts within a tight framework of known individual physiological capacity that not only optimizes speed but most importantly metabolic efficiency, thus paving the way to a better run leg that in triathlon will always start ugly and get uglier due to rapidly depleting glycogen reserves. 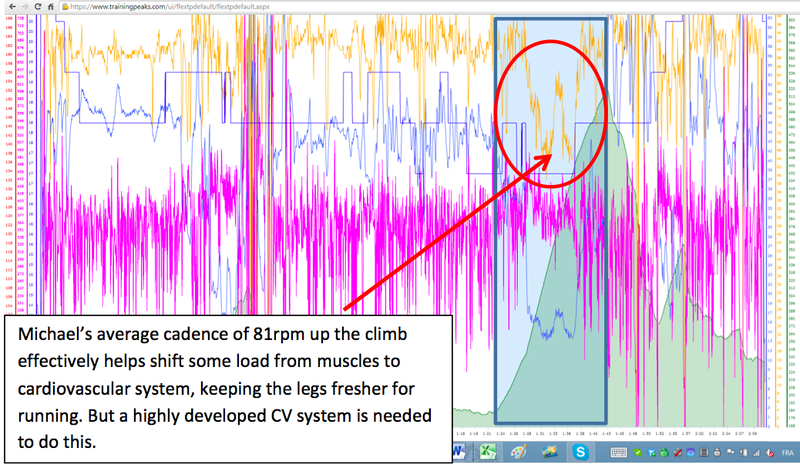 To that end, an athlete should strive to keep a lid on high end power, avoid power spikes and also aim to keep driving the pedals when gradient is mildly negative. In this regard our two athletes, Michi and Ian, are exemplary, indeed the overall similarity of the files, albeit not the absolute numbers, are a testament to Ian’s ‘professionalism’. Ian was instructed to stay below 280W on the climbs (I know that above this wattage he is burning through his precious glycogen stores at an unacceptable rate) and around 220-240W for the rest of the ride. From the numbers below you can see that he executed beautifully. Michi, as per normal, delivered smooth, controlled and huge power from start to finish. Note how he does not let the power drop on flatter sections which is a great way to ensure a fast split. 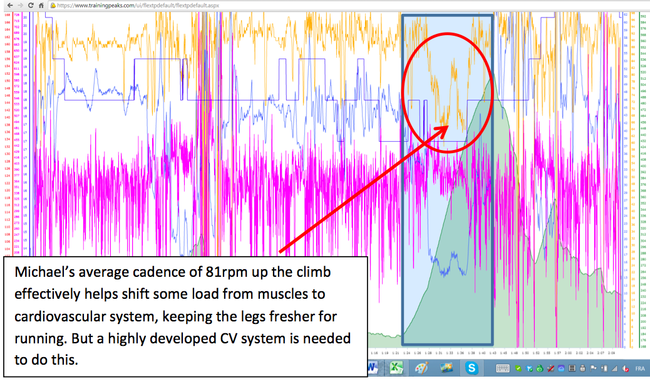 So often, whether due to less well developed muscle endurance, fatigue or simply a drop in concentration, we see age group athletes letting power output fall away at this point only to get back on it again when climbing resumes. It is an acquired (trained) skill but learning to ‘push’ constantly is an attribute we age group athletes should pursue in training. However, patience is required – this type of strength takes years to build! From the table above note how our athletes both consumed large quantities of carbohydrates on the bike – both taking on around 2.1 g of carbs per kg of body weight. This is about as much as either could handle without incurring GI distress. Note that Michi, due to a higher work rate, expended around 600KJ more than Ian. However, because of his ability to metabolise fat as a source of fuel at relatively higher intensities, he will hit T2 feeling considerably ‘fresher’. 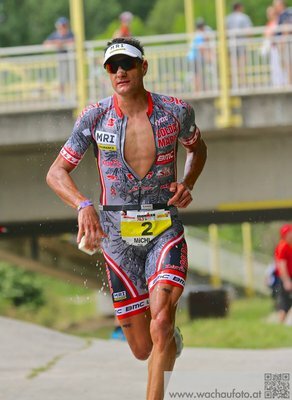 Metabolic efficiency is incredibly important in long course racing and especially in full Ironman where every athlete is running on fumes by the second half of the marathon. The rest of the key comparisons in the table tell us a story we already largely know – that Ian optimised and executed like a true pro and Michi can go harder and for longer than many ever will! While not a big climb (hey, I live in the Alps! 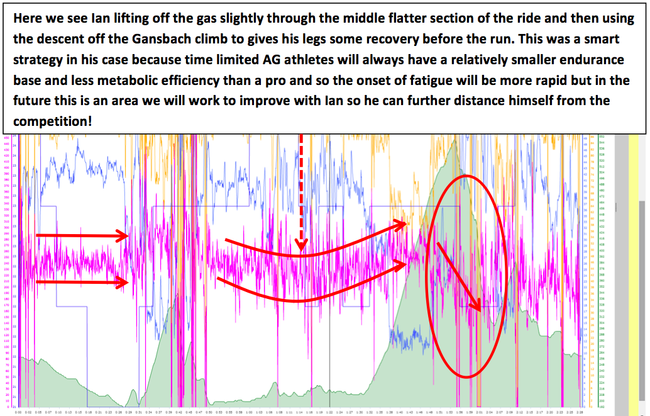 ), Gansbach comes at a point in the loop when athletes are feeling their effort and so it is very important that it is climbed conservatively in relation to the individual’s limits and if possible, with a fairly high cadence as this reduces the muscular impact while transferring some of that load to the cardiovascular system if it is sufficiently trained to handle it. This in turn saves the legs for the run. Note the different cadences between Ian and Michi on this climb. This is not because Ian executed incorrectly but rather because he ran out of gearing! Michi, using even less gearing than Ian, has more aerobic capacity available to him which means that even at 370W he is relatively comfortable where any age group athlete will be approaching maximum heart rate within a few minutes! 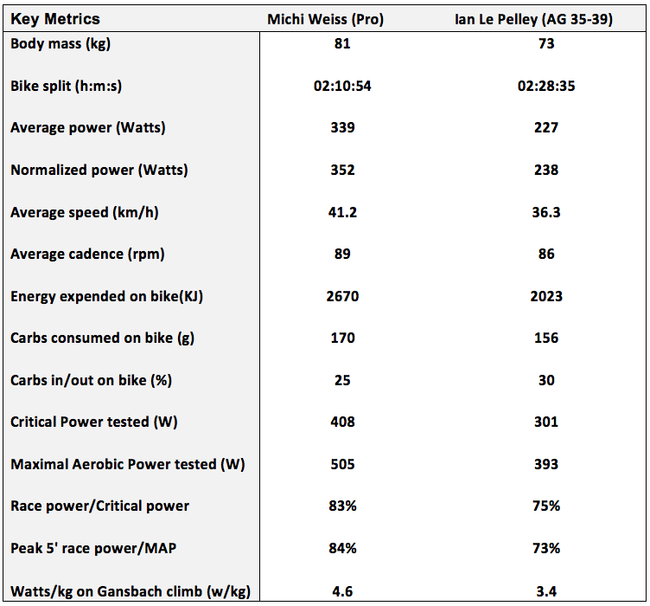 The conclusions to be drawn from this race and from the comparisons I have made between our two star athletes, Ian Le Pelley and Michi Weiss are as follows: Ian is a time limited age group athlete who has excelled in just his second ever IM 70.3 race ranking highly within his age group (I should mention that Ian is sublime swimmer and posted the 20th fastest swim of the day including the pro ranks!). 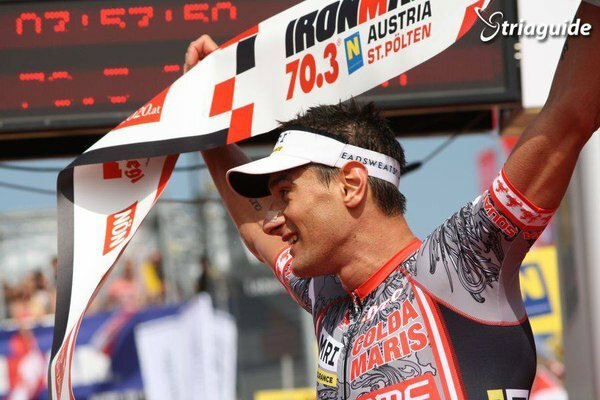 He has trained exclusively for Olympic distance racing in these past few years and that speed transfers nicely to 70.3 (as we see increasingly in the pro ranks with the likes of Frodeno, Don et al.). However, the longer the racing the more muscle endurance, as in the ability to sustain moderate muscle tension for several hours combined with high metabolic efficiency needed to fuel a high work rate while sparing glycogen stores, becomes increasingly relevant to high performance. To a considerable extent these attributes are trainable and most age group athletes respond well to the type of training and nutritional manipulation required to improve these areas. Ian has much to gain from this approach as he transfers from shorter to longer distances and, although not good news for his competition, he will get better and better. However, as we can see from the magnitude of difference between an excellent age group athletes’ numbers and those of a truly world class athlete like Michi, there is no getting away from the fact that while some of us, with the right attitude, training and application, might aspire to the performance levels showcased by Ian last weekend, matching the performances of the men and women at the very top of our marvellous sport is a pipe dream. But thanks to SRM power we are able to get a real insight into the awe inspiring performances these incredibly gifted athletes are turning in everytime they show up at a race. But fear not, the rest of us can all get a lot better yet. Measured, precise and intelligent use of power training together with proper recovery and nutrition is the way to attaining your goals. 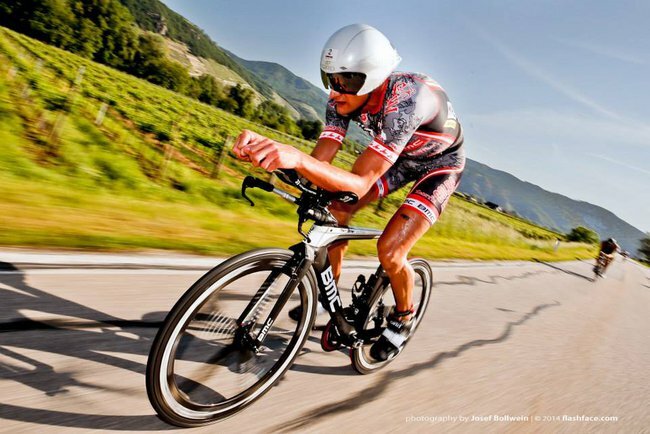 SRM power will just get you there faster! Once again, thank you to Michael Weiss and Ian Le Pelley for letting me pull apart their files. We wish them both continued success with the rest of their season!